British general and governor of Massachusetts, second son of the first Viscount Gage, was born in 1721. He entered the army in 1741 and saw service in Flanders and in the campaign of Culloden, becoming lieutenant-colonel in the 44th foot in March 1751. In 1754 he served in America, and he took part in the following year in General Braddock's disastrous expedition. 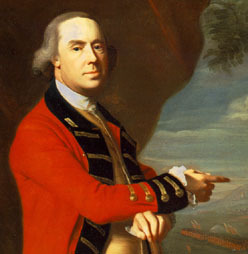 In 1758 he became colonel of a new regiment, and served in Amherst's operations against Montreal. He was made governor of Montreal, and promoted major-general in 1761, and in 1763 succeeded Amherst in the command of the British forces in America; in 1770 he was made a lieutenant-general. In 1774 he was appointed governor of Massachusetts, and in that capacity was entrusted with carrying into effect the Boston Port Act. The difficulties which surrounded him in the execution of his office at this time of the gravest unrest culminated in 1775, and the action of the 19th of April at Lexington initiated the American War of Independence. After the battle of Bunker Hill, Gage was superseded by William Howe, and returned to England. He became general in 1782, and died on the 2nd of April 1787.